What on earth is a glory hole? IMG_1813, originally uploaded by Mic2006. 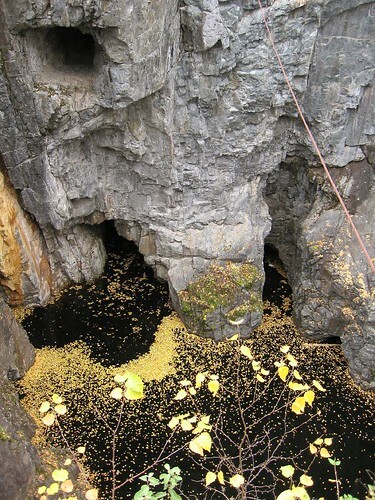 At the edge of Cobalt there is a deep open pit that is said to drop down 250 feet. The bottom is filled with cold, black water. A cable cuts across the top right of the picture. 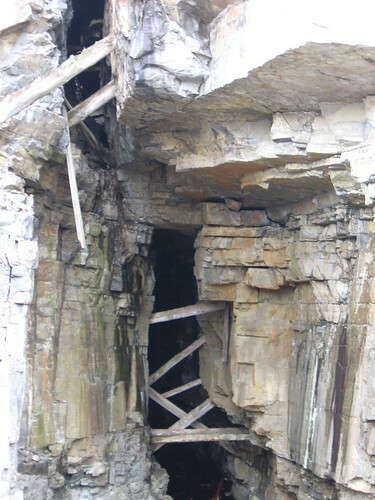 At one time there was a spider web of these strands that supported a tin roof to protect the miners below. 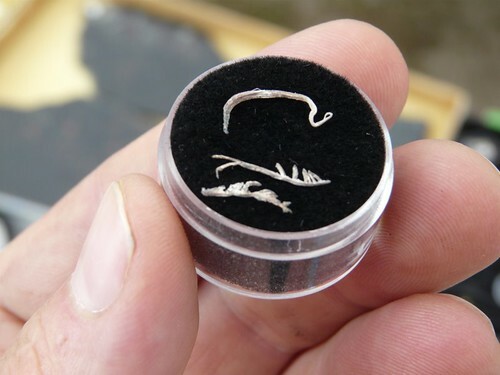 The tunnels cut inwards along the silver seams. 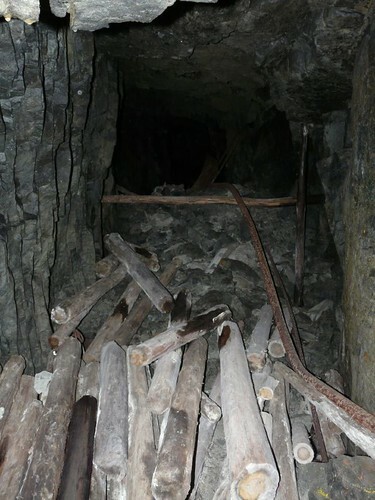 At night the “High grader” was said to make his own private excavations using stolen dynamite. 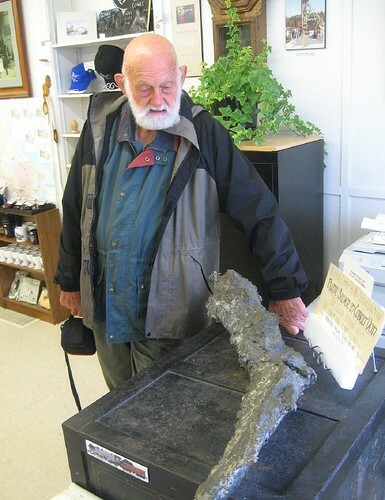 Doug Shearer, a knowledgeable local historian said, why bother digging to steal the stuff?It was lined up in wagons beside the station, solid slabs of pure, raw silver. “What a waste of time! There was nobody to stop them from hijacking a wagon load”. In Cobalt all the locals have an “abandoned mine story”. Down along the shores of Long Lake I met a guy who was walking his dog early in the morning. He reminisced about a candle-lit journey that he had made as a teenager from a tunnel far out in the forest. They walked along in the dark, their light flickering with an unpredictable breeze that blew from within. Eventually they were reduced to crawling, the hot wax raising blisters on their skin. Through a tight squeeze they emerged into sunlight window way up the inside of the “Glory Hole” I am not sure how much the water has risen since his youth but it would seem to me that one of these exposed entrances might be the one. IMG_1905, originally uploaded by Mic2006. Miro, a former Polish Mine worker got quite excited when he saw my photo. “We used to call those “gornicza tadowarka” (mine dumpers)”. They were powered from compressed air that fed from the surface. Apparently the pressure could vary quite considerably depending on how far you were from the main line and how many other people were using dumpers at the same time as you. Midnight shift was the best time for optimum power. Gently rotating his wrist Miro demonstrated how to operate the controls. The operator stood on a platform to the side of the engine and the scooper would lift rocks into the ore carts behind. “Dont turn your hand like this, (a jerking twist to which he howls with laughter)too much air, the machine jumps like a horse. The rock falls out of the spoon and everyone breaks their leg”. 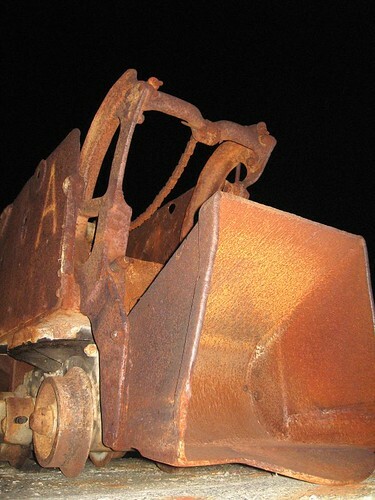 This photo is of one of the mine dumpers used in Cobalt. The air power came from a condenser at the nearby Ragged Chutes. This kind of equipment is scattered all over the town of Cobalt. It is on the surface above, hidden in the bush and moonscape of the mine dumps. A great many old relics are also said to lie untended in the tunnels beneath the town.